Women bare their breasts for strangers to touch at the wildly popular Running of the Bulls festival in Spain. 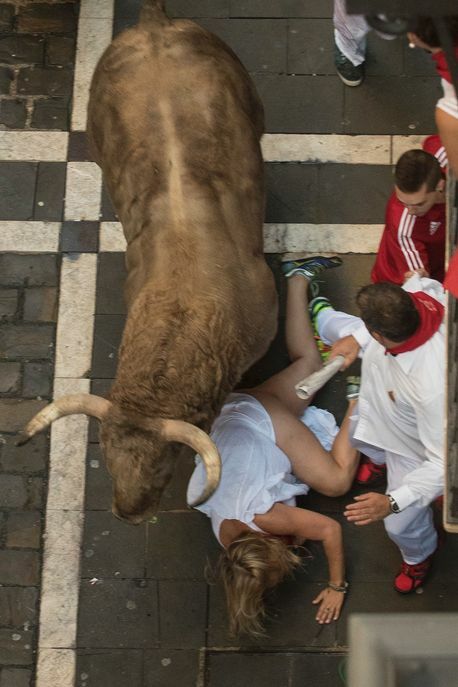 The Spanish tradition of the running of the bulls is considered strange and even cruel and barbaric by many. But the annual festival still holds nonetheless, with thousands of wine swilling people filling the street during the colourful, heart quickening festival. Pamplona streets were turned into a sea of red as thousands of wild revellers turned out for Spain's annual Running of the Bulls festival. 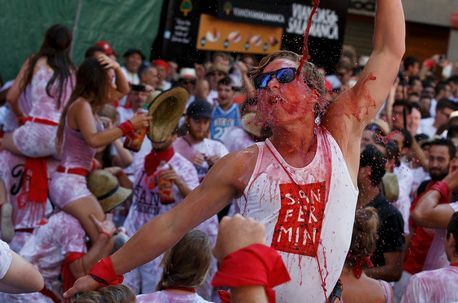 People ran through the streets alongside rampaging bulls the start of the famous San Fermin fiesta as the often drunk revellers were being sprayed with red wine and acting crazy. Thousands of jubilant Spaniards packed into the main square decked-out in traditional white outfits and waving red neckerchiefs and flags in the air as the festivities got underway. Several women were spotted lifting their shirts and allowing strangers touch their bare breasts. It was as crazy as the festival gets. Four people have already been injured by the bulls, with more incidents expected.